The Family Sip never really did the Christmas family photo thing, but for some, it’s an annual tradition. And it really shouldn’t be, given how awful most of them turn out. I ask that all you little sippers proceed with caution through this list. The ugly mugs are bad enough and now you also have to deal with some truly deranged people. Enjoy! Am I the only one a little horrified that this guy seems so delighted to be wearing a diaper!? I got a 20-spot on the dad wetting himself before the child… otherwise it’s a wasted diaper which are clogging up our landfills. The look on the kid’s face really tells the story here. I call it the ‘scarred for life’ pose and the youngster is pulling it off to perfection. It looks like they’re trying to recreate the Human Centipede movies and daddy is going to smack mommy’s backside red! You only hope this photo was later used in court documents… I just can’t decide which one of the family members would be first to sue for divorce, the kids or the mother. I hope Mrs. Sip is in for some reindeer games this holiday season! Someone really didn’t want to take part in the annual family photo and I don’t really blame him. No, it seems Eric Forman here wanted nothing to do with this photo shoot. He was probably pulling his ‘rebel with a Christmas cause’ act because his big bro is so into the project. That’s because he knew he was rockin’ his new goatee and he wanted to memorialize the look for prosperity. 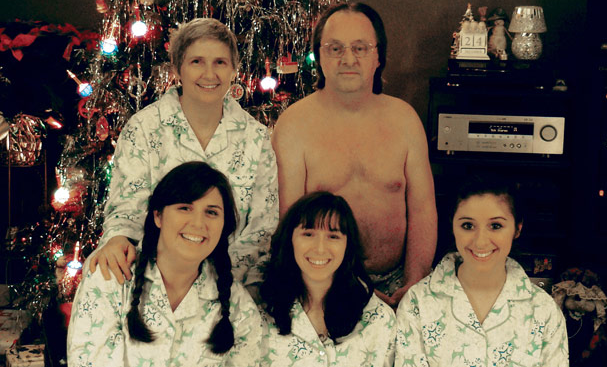 It looks like dad didn’t get the memo on what to wear for the family Christmas photo. Perhaps he was just recently released from prison and didn’t have time to purchase a new wardrobe. The scary part is that if these girls are comfortable with how their father is portraying himself in this photo, that means he dresses this way around the house all the time… and that’s not cool. I’m surprised the setting for this isn’t a trailer. 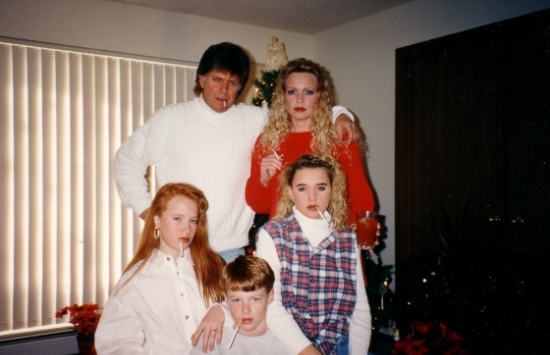 This seems like the wrong message to be sending to your kids… you should never have them suffer through family Christmas photos. Oh, and the smoking thing is pretty weird! I wonder if they also received an ashtray in each of their stockings? Then again, trailers don’t have chimneys for said stockings to be hung! 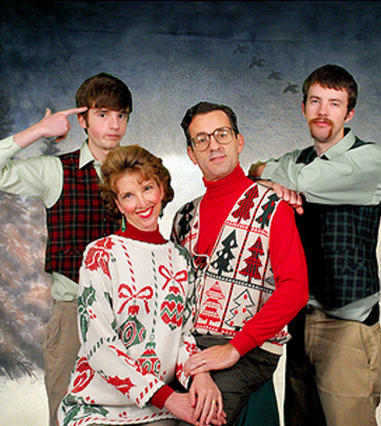 Do you have a favourite family Christmas photo that I haven’t covered or have a hilarious caption to one of these gems that you just must share. Let’s turn this Silent Night into an uproarious occasion of laughter and joy! A couple quick notes about alterations I made from the original recipe listed above. 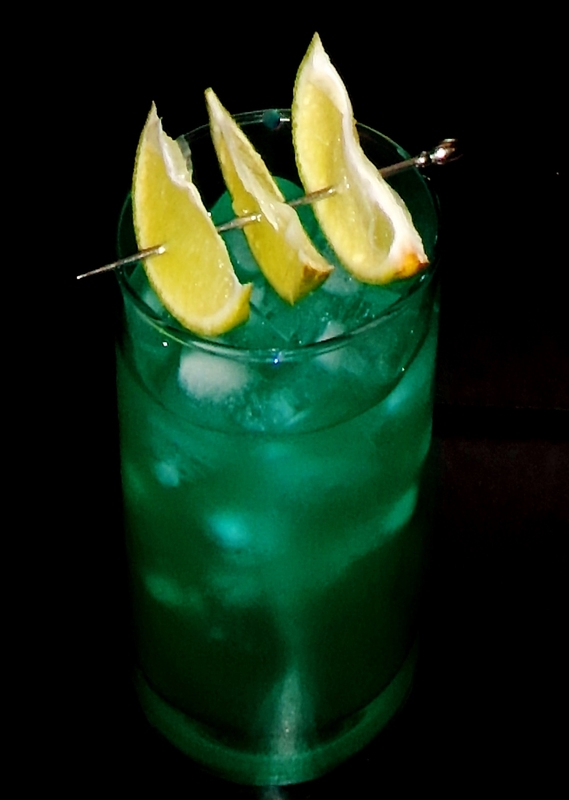 I completely removed the Triple Sec as Blue Curacao is basically the same ingredient, only blue and I swapped Pineapple Juice out for Pineapple Soda because I wanted some fizz with this drink and also wanted a clearer liquid than Pineapple Juice offers. The result wasn’t too bad, but I’m still not a huge Pineapple liquid fan, despite loving Hawaiian pizza.